Gambling group Ladbrokes has confirmed it is in talks to buy online gaming firm 888 Holdings. Ladbrokes executives are meeting 888 management to discuss the takeover - valued at about £470m - but it said that no deal was imminent. Gibraltar-based 888 has previously revealed it was in discussions with unspecified firms, following the suspension of its business in the US. It has been linked to a £1.6bn merger with Partygaming. However according to a report in The Mail on Sunday, 888's majority shareholders are keener on a tie-up with traditional gaming firm rather than another online venture. 888's outgoing chief executive John Anderson is a former Ladbrokes executive director and has close contacts with firm, which also has a Gibraltar office. 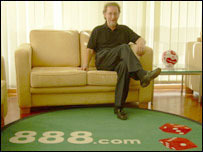 "We're in the early stages of reviewing a possible transaction involving 888," said a Ladbrokes spokesman. "No decision has been made about whether a proposal will be made." 888, Partygaming and other online gaming firms have been victims of US law changes - which have effectively criminalised internet gambling. Experts have predicted there will be a round of consolidation in the sector following new moves which will make it impossible for Partygaming and a clutch of other British online betting businesses to collect revenues in the US. Analysts now expect companies to switch their focus from the huge US market to concentrate more on Europe and Asia. Last month Partygaming said its decision to exit the US market in the wake of the new legislation would cost it about $250m (£133m). The company had generated around 75% of its income from the US market while around half of 888 Holding's business came from the country. The new laws also led to a slump in the gaming sector on the London market. Partygaming shares have sunk by around 70% and 888 by 24%.